Is Xylem Inc (XYL) A Good Stock To Buy? Before we spend days researching a stock idea we’d like to take a look at how hedge funds and billionaire investors recently traded that stock. S&P 500 Index returned about 7.6% during the last 12 months ending November 21, 2016. Most investors don’t notice that less than 49% of the stocks in the index outperformed the index. This means you (or a monkey throwing a dart) have less than an even chance of beating the market by randomly picking a stock. On the other hand, the top 30 mid-cap stocks among the best performing hedge funds had an average return of 18% during the same period. Hedge funds had bad stock picks like everyone else. We are sure you have read about their worst picks, like Valeant, in the media over the past year. So, taking cues from hedge funds isn’t a foolproof strategy, but it seems to work on average. 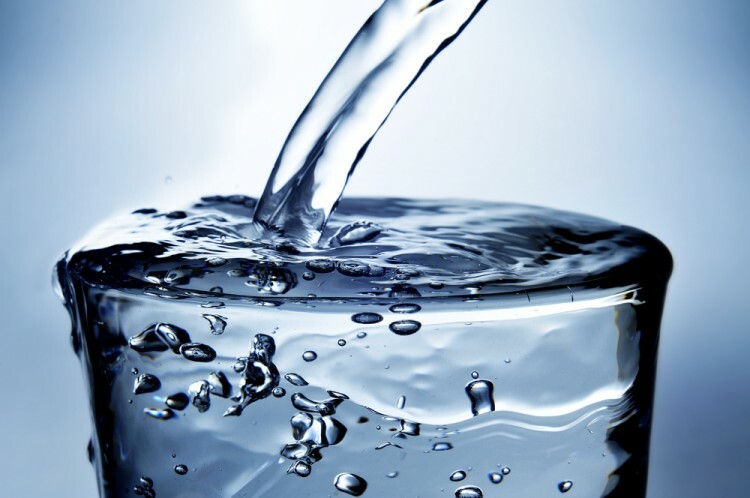 In this article, we will take a look at what hedge funds think about Xylem Inc (NYSE:XYL). Xylem Inc (NYSE:XYL) was in 17 hedge funds’ portfolios at the end of the third quarter of 2016. XYL investors should be aware of a decrease in enthusiasm from smart money in recent months. There were 21 hedge funds in our database with XYL positions at the end of the previous quarter. At the end of this article we will also compare XYL to other stocks including CBRE Group Inc (NYSE:CBG), Vereit Inc (NYSE:VER), and Bancolombia SA (ADR)(NYSE:CIB) to get a better sense of its popularity. Now, let’s view the key action encompassing Xylem Inc (NYSE:XYL). Heading into the fourth quarter of 2016, a total of 17 of the hedge funds tracked by Insider Monkey held long positions in this stock, a drop of 19% from one quarter earlier. 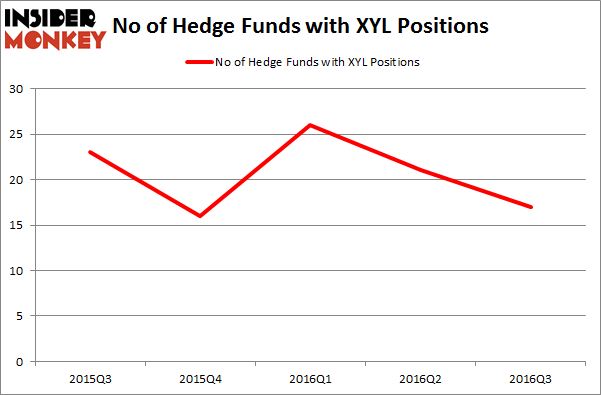 The graph below displays the number of hedge funds with bullish position in XYL over the last 5 quarters. With hedge funds’ positions undergoing their usual ebb and flow, there exists an “upper tier” of notable hedge fund managers who were boosting their stakes meaningfully (or already accumulated large positions). Of the funds tracked by Insider Monkey, Mario Gabelli’s GAMCO Investors has the biggest position in Xylem Inc (NYSE:XYL), worth close to $203.1 million, comprising 1.3% of its total 13F portfolio. The second largest stake is held by Impax Asset Management, led by Ian Simm, which has a $113.1 million position; 5.2% of its 13F portfolio is allocated to the company. Some other members of the smart money that hold long positions comprise Anand Parekh’s Alyeska Investment Group, Cliff Asness’ AQR Capital Management and Robert Joseph Caruso’s Select Equity Group. We should note that Impax Asset Management is among our list of the 100 best performing hedge funds which is based on the performance of their 13F long positions in non-microcap stocks. Helen of Troy Limited (HELE): 73% Surge in Smart Money Ownership; What’... Is Cabot Corp (CBT) A Good Stock to Buy? Should You Get Out of UniFirst Corp (UNF) Now? Hedge Funds Are. Vince Holding Corp (VNCE): Hedge Funds Keep Heading Elsewhere Is It Time to Buy Ultra Clean Holdings Inc (UCTT)? Smart Money Thinks So. Is Vitamin Shoppe Inc (VSI) Going to Burn These Hedge Funds?